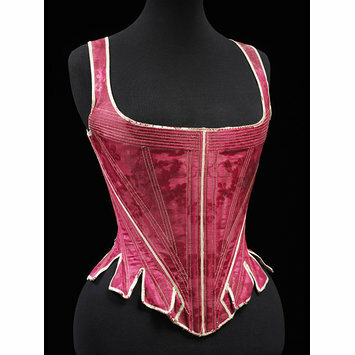 Given by Messrs Harrods Ltd.
Women’s underwear served two purposes in the 18th century. The first function, carried out by the shift or smock, was to protect the clothing from the body, in an age when daily bathing was not customary. Made of very fine linen, the shift was the first garment put on when dressing. Over the shift went the linen stays, heavily reinforced with strips of whalebone. 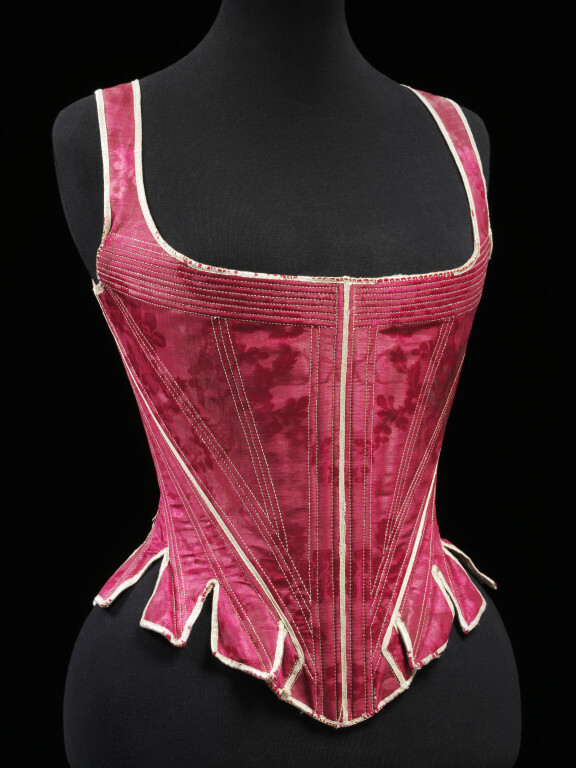 Their purpose was to mould the torso to the fashionable shape and provide a rigid form on which the gown could be arranged and fastened. The hoops were also made of linen and stiffened with whalebone or cane. They shaped the petticoat of the gown to the appropriate silhouette. At various times during the 18th century, this profile varied from round, to square and flat, to fan-shaped. In her 1778 novel, The Sylph, Georgiana Cavendish, Duchess of Devonshire wrote: 'Poor Winifred... broke two laces in endeavouring to draw my new French stays close... Then they are so intolerably wide across the breast that my arms are absolutely sore with them; and sides so pinched! But... to be admired, is a sufficient balsam'.